A Capital Metro shuttle on UT's campus. Route CR will be shortened and renamed CLC, which will operate for one semester before shutting down. 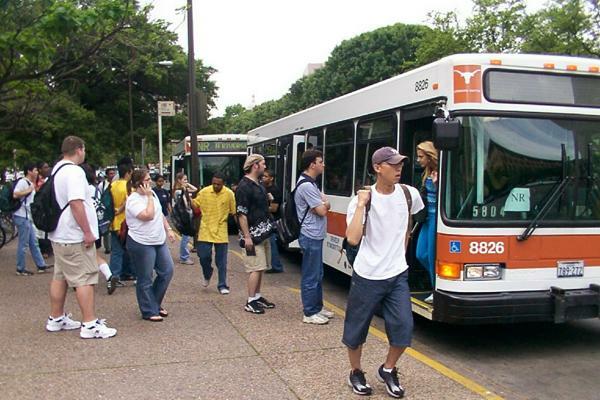 Tight budgets could leave some UT Austin commuters without a bus line in the upcoming semester, according to Cap Metro. The Wickersham Lane (Route WL) shuttle will be eliminated this semester and the Cameron Road route (Route CR) will be shortened this semester, renamed Route Camino La Costa (Route CLC) and then eliminated after the spring semester. The transit authority attributes the cutbacks to a persistent lack of funds from UT's Student Services Budget Committee. "Unfortunately, for the past several years, there has not been an increase to any of the organizations funded through the [Student Services Budget Committee] based on financial constraints across the University," the email reads. "Thus, the shuttle system cannot continue to operate at the same levels as before." Despite student protests, Cap Metro says shuttle operation costs have risen in the past few years, and that the routes are the lowest-performing routes in a measurement of numbers of riders versus the cost of maintaining the line. Nearly 100 students spoke out against the proposed changes in both lines. Student Lauren Miller says the route changes will negatively impact a growing student community along the Cameron Road route. "It will promote student flight, and cause the local economy to become disadvantaged as services that cater to students move elsewhere," Miller wrote in a statement to Cap Metro. "This 'proposal' also disproportionately targets low-income, scholarship, and graduate students, which make up the majority of student residents along the CR route." Changes are coming to North Austin Cap Metro lines on Jan. 7, 2014. 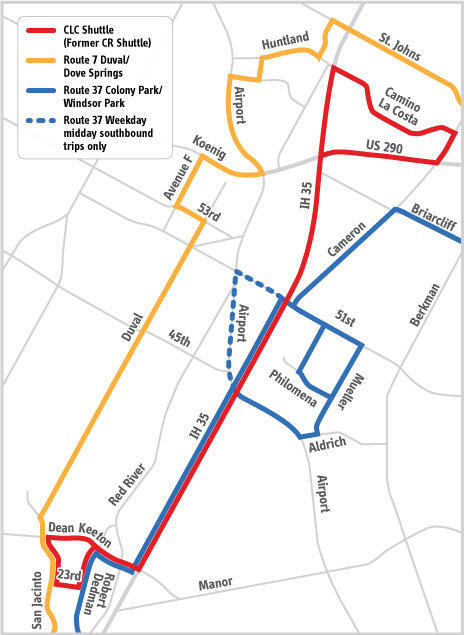 Cap Metro suggests riders of Route CR should use the Colony Park/Windsor Park shuttle, and Route WL riders are advised to use the realigned Riverside line. Many respondents said eliminating Route CR entirely, as was originally proposed, would have forced students living in apartments along Camino La Costa to walk long distances to bus stops through rough areas of town. Operating Route CLC throughout this spring was the compromise. But some Capital Metro customers were still angered. Amanda Linn commented that adding in Route CLC "does nothing to help the students living off Cameron Road." "The students living in apartments off of Cameron Road also are locked into leases through August and moved into those locations solely based on the availability of the UT shuttle and affordability of housing in the areas," she said. Students who wished to see the Wickersham Lane route continue voiced arguments along the same lines, though fewer comments spoke out against Route WL's elimination. "I understand that there are not many people who take [the Wickersham Lane bus]; however, there are some among us who really need this bus to get to UT campus," Justin Park, a UT freshman, wrote. "Living on-campus is unaffordable so I live off campus and rely on using this bus." Additional changes affecting some of Capital Metro's mainline routes will take place on Jan. 26 as a part of the company's regular re-routing process, including the addition of the MetroRapid bus, which will offer bus service every 15 minutes at stops along North Lamar to Guadalupe and South Congress. The company adjusts bus routes seasonally in accordance with its service guidelines and in response to feedback. Austin’s new express bus service has a launch date. On Jan. 26. Capital Metro’s MetroRapid service will begin offering bus service at least every 15 minutes – and even more during rush hour.